On Monday one of my colleagues found this scared little fellow wet and cold. He was trying to cuddle up to a pipe in the school corridor. Poor fellow had lost his mother and was much too young to fend for himself! We thought he looked a bit like Alf - remember Alf?! Anyhow, we wrapped him in teatowels and popped him in a photocopy paper box where it was nice and dark and cozy! We called a lovely lady who does wildlife rescue who came to pick him up and mollycoddle him. She thinks he would only be a few months old. I love your layout--especially the little O possum pun =) What a cutie! 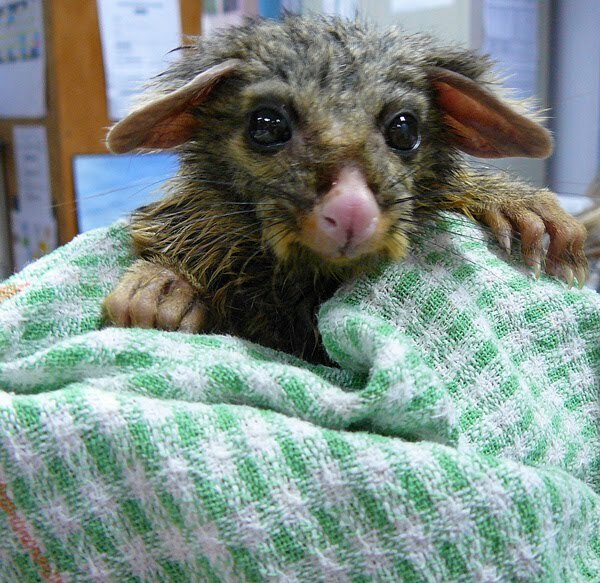 I once held a possum baby in a sling at a hands-on zoo. He was very very snuggly! Esther, firstly, thank you for your comment and link. Your album is simply amazing. What great photos !! I'm going to post the link on my blog if you are okay ? Secondly, what a beautiful blog & style you have here. Thirdly (;-)), I love this small pet, he seems to be afraid, I think Alf is his father ... I hope he will have a good life now. Unbelievably cute Esther, but what big nails/claws he has. The page you have created is nothing short of gorgeous.